Have you ever encountered problem with your toilet plumbing, sewer or even the septic system? Do you not favor the foul smell emitting from the toilet whenever one flushes it down? If you have an ample space around your home, why not consider building an outhouse. You can keep all your worries at bay as it also assists to improve the health of both you and your family as well. It does not consume much time to get one up and ready as it is relatively easy once you get hold of the right tools and materials. You can try it out yourself today by following the step by step guide on how to build an outhouse suggested below. Firstly, choose a spot where you would like your outhouse to be built in. The area should be preferably as far away as possible from your home and also from water supply such as the stream, brook or river. After you have decided on the spot, start digging a pit as a base. The pit should be about one meter by one meter wide and two meter deep. It is advisable to be deep enough to last for quite some time. Next, you can start to construct the floor with the help of either concrete or wood. Do remember to add a hole in the center of the floor to enable the waste to go through it. On the other hand, ensure that the sides of the floor fit tightly especially over the hole that have just been dug up. You can opt to form a cover for the floor by adding a riser. The riser can be constructed from a wood box and then add another hole on top of it. This will give you extra support for sitting on it later taking into consideration that majority of people sit with their knees above the hip. After that, paint the pit to cover it up. In case of rain, you can use corrugated or roll roofing. Last but not least, ventilation is a crucial part for a toilet. The type of ventilation depends on the kind of outhouse you would like to have. A simple one will just be a conventional opening in the shape of a crescent moon. If you think that is insufficient, you can attach screen panels to the top of it. 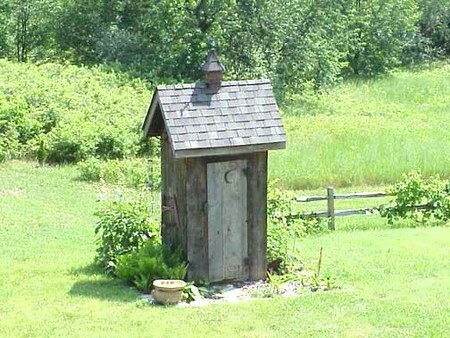 Now, you can have your own privy that you can use for your own convenience while enjoying the back to the nature feel. It may sound odd, impractical and traditional. Nevertheless, do not be afraid to give it an attempt as it is cool and has nostalgic values.